I’ve had plenty of awesome knuckle tattoo ideas over the years. Then one day I was listening to Dust in the Wind by Kansas, which got me thinking about the Socrates scene in Bill & Ted’s Excellent Adventure. 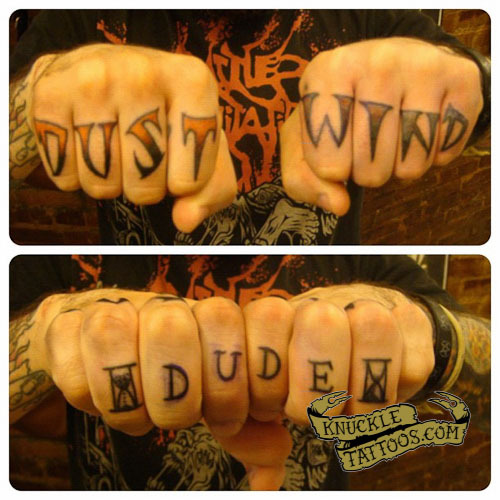 I realized DUST and WIND would make excellent knuckle tattoos! Representing the Earth and the sky. Life and Death. Good and Evil. Yin and Yang. Opposites. All encompassing. As well as a fantastic classic rock ballad.. AND a totally excellent, important, classic movie to me, from my youth.. if only i had one more hand to add DUDE to the mix… OH! How bout just moving down a segment and split it in half! why not add some hourglasses, too?! and VOILA! the birth of the most awesome knuckle tattoos in history! Kansas, Bill & Ted, and Socrates! All in one! Can’t beat it! i love em! They were done by the lovely and super talented Tasha Rubinow, at the shop I work at Inborn Tattoo, in NYC.